The Monoprice 109551 14' CAT-5e Ethernet Network Cable, Black, is ideal for 1000 Mbps networks and provides dependable data transfer. Ensure a reliable Ethernet network connection between your system and router using the Monoprice 109551 CAT-5e Cable. 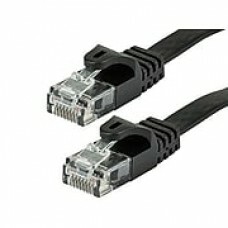 Both ends of this networking cable are fitted with RJ-45 male network connectors for smooth transfer of signals. Its good-quality jacket properly insulates the copper conductor and is flexible, reducing the possibility of cable damage.